An interesting view point of the Robert Moses Niagara Power Plant along the Niagara River in the State of New York, USA, near the popular tourist attraction - Niagara Falls. At the Robert Moses generating station, there are 13 generators with an output of 2,275,000 kilowatts with a maximum water diversion of 109,000 cubic feet per second. 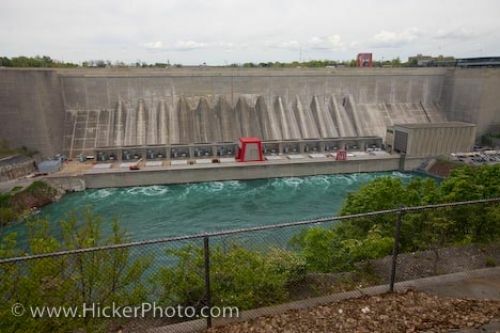 The power plant changes the course of the Niagara River above the falls and then replaces the water into the river below near Lake Ontario. Throughout the year, visitors to the State of New York who visit Niagara Falls, either the American or Canadian side, can enter a glass enclosure along the edge of the gorge where spectacular views of the Niagara River and two power stations can be seen. There are no tours open to the public of the Robert Moses Niagara Power Plant but everyone is welcome to explore the displays and models which delights children and adults. Here visitors can learn about the generation and history of electricity while taking in the sights. Picture of the Robert Moses Niagara Power Plant in the State of New York, USA which diverts the water above Niagara Falls. Robert Moses Niagara Power Plant, Niagara River, Niagara Falls, State of New York, USA.